Carefully the painter gets the last step. He puts his ladder against the wall on the left side of the building. His colleague has put down another ladder on the right side. The painter steps backwards, tilts his head and looks at the glass panel that both men some minutes before attached with the utmost care to the facade, above the shop entrance. "Glass, paints & colors, Home & Decor Painter" he reads aloud. For weeks he has worked on this panel: cutting glass to size, gilding the decorations on the backside of the glass and finally painting the whole panel with a dark color. Then the sun breaks through and the gold leaf details begin to shine like a delight. The painter smiles proudly and says quietly: "Nice job. Let the assignments come in." It is 2012. The glass panel is still hanging on the same facade where it was previously attached nearly 100 years before. The panel has not lost its quality. As a matter of fact, the gold leaf details sparkle just as much as when the painter gilded them with such precision. A true masterpiece. 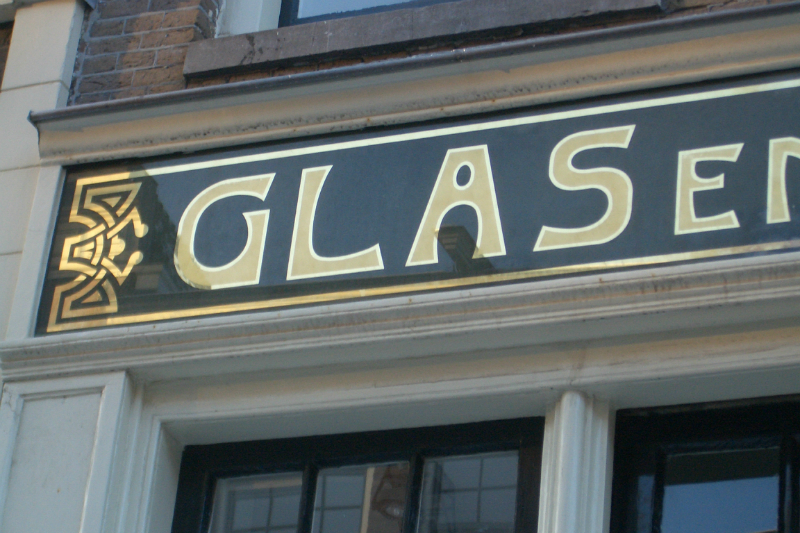 Around 1900 these kind of decorated glass billboards were a common phenomenon in Dutch streets. The panels were manufactured to advertise items such as liquor, tobacco, coffee, tea, or chocolate, but also to draw attention to the shop. In those days it were painters and glass workers who had the knowledge and skills to make these panels. Unfortunately the techniques were almost forgotten after WWII. Almost. Schitterend from Diemen (near Amsterdam, The Netherlands) has revived the techniques again. What did a painter in the old days used to do? Besides maintenance of woodwork in and around the house, a painter often also did advertising paintings. It started at a time when there were no street names yet. Houses and shops were characterized by plaques and signs. A person lived in ‘the third house left of the gilded herring’ for example. Decorative painting techniques to create recognition were mainly applied on wood, stone and occasionally on wrought iron signs. It was not until after the mid-nineteenth century that glass became available in large volumes because of mass production, and thus became affordable for a much larger audience to be used as a decoration and advertising medium. The simplest expressions were provided with letter painting. Later on additional decorative techniques such as engraving, grinding, etching, sandblasting, muslin, gilding and silvering were added. 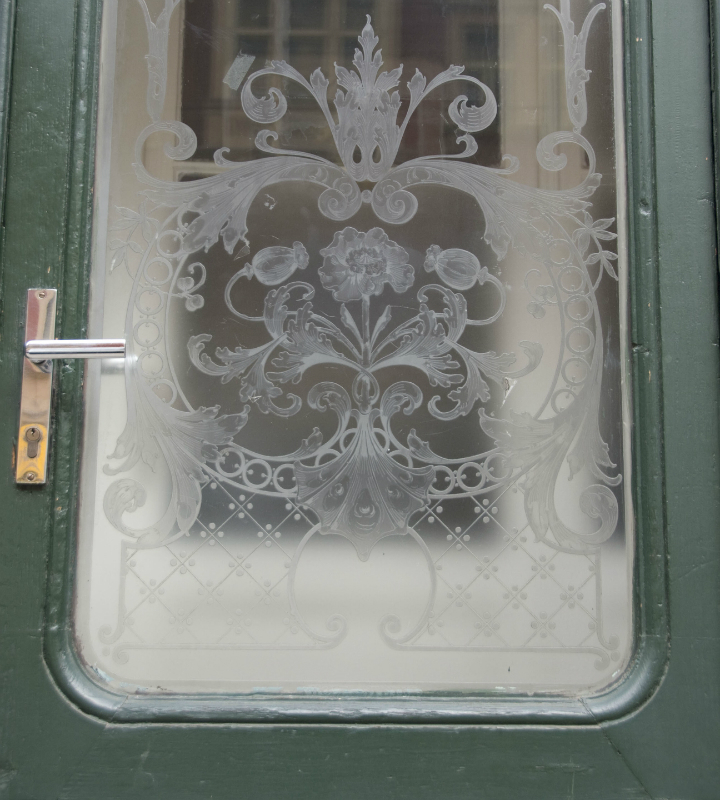 As mentioned before, after WWII this artful way of decorating glass disappeared quickly from the streets. Why did it not turn back? Mainly because everyone was too busy with the reconstruction of the country and that had to been done as quickly and cheaply as possible. This lack of investment to create something beautiful resulted in the fact that the older generation painters and glass workers could no longer pass their knowledge to next generations. And so these techniques were almost forgotten in The Netherlands. 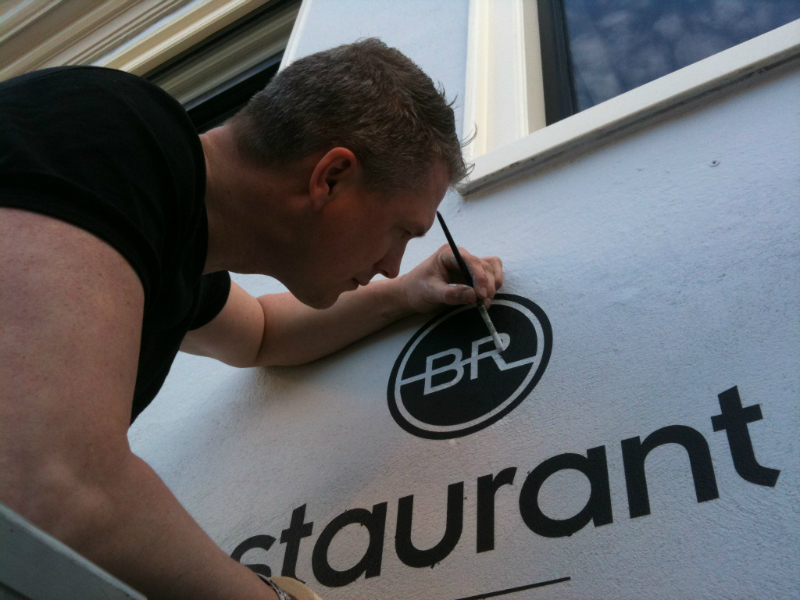 ‘Schitterend’ (a Dutch word, meaning both brilliant and beautiful) is Erik Winkler; advertising producer and decorator. Under the name Schitterend he makes alongside various decorative items also art behind glass (also known as Hinterglas Malerei, or Verre Eglomisé). Erik masters the art of craft gilding behind glass, silvering, etching and all the other techniques that master painters in the old days used. Based on that old knowledge Schitterend now makes both contemporary and traditional designs. The decorative art from Superb thus creates a renaissance, a rebirth, of glass, gold and silver, that would not look out of place on a beautiful architectural project. 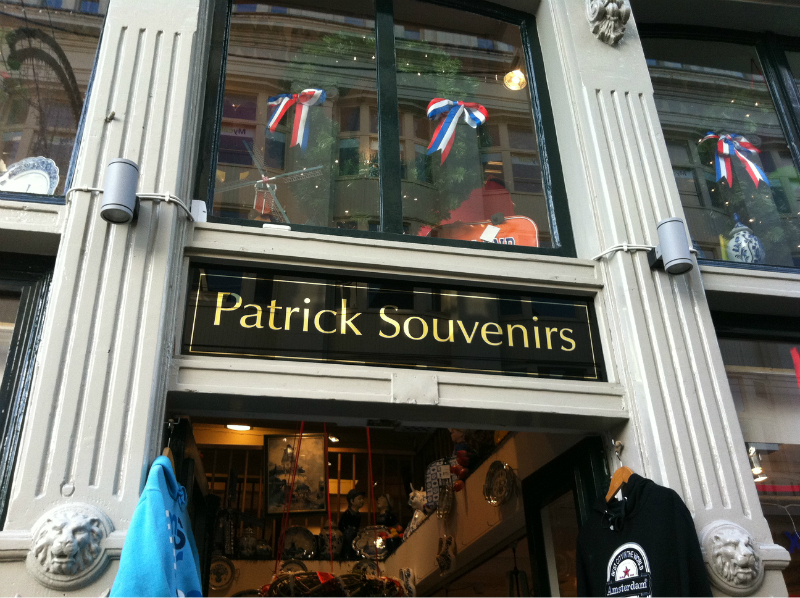 Retailers have interest in his work because gilded lettering and decorated glass billboards have a chic look and in an inimitable way attract attention. Private individuals are also interested to hang a glass panel of his artwork on the living room wall. 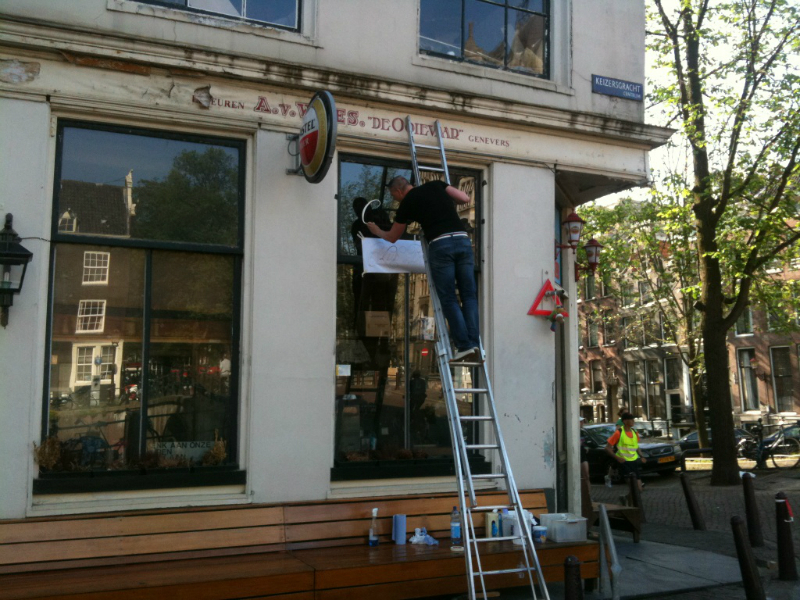 Restaurateurs have now also found their way to Schitterend, because Schitterend can restore or recreate damaged antique objects as good as new. 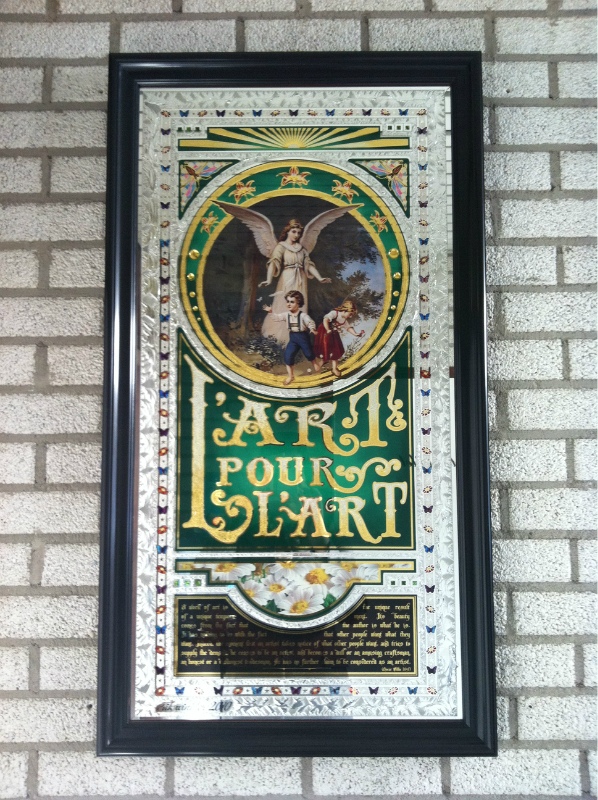 In The Netherlands, Schitterend is one of the few that masters the overall palette of old techniques, that the old masters used in their decorative glass panels. Winkler has thus reinstated this profession after years of experimenting, belonging to the top both national and international. Winkler was born and raised in Amsterdam in a painter family. In the 70s of the last century the family business, Decoration Studio Ferry Winkler, turns into a full-service decoration studio where various kinds of advertisements for indoor and outdoor are manufactured, such as car wrapping, stand, full color printing and wall advertising. 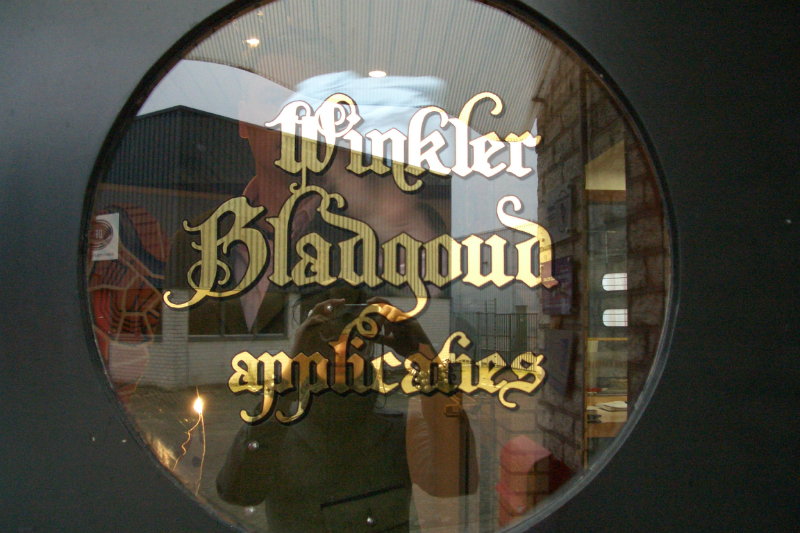 After his Master in art history & archeology Winkler and his brother take over the family business. His interest to be able to make that typical advertising glass art grows. Winkler wants to make monumental objects, just as the painters of 100 years ago, which can be admired for decades to come. More and more he immersed himself in the old painter crafts. His expertise in this field Winkler learns by reading huge volumes of books, studying old recipes, but especially by experimenting. An obstacle Winkler often ran into is that (old) colleagues, at home and abroad, previously shared so little information. "I think a lot painters and glass workers were afraid of competition. Painters gathered their knowledge for many years and did not want to give that knowledge away that easily. Knowledge therefor remained only within the family, passed from father to son and unfortunately little is put down in writing. As a result it took me a long time to find out it out myself. Usually it went two steps forward and one step back. It takes a long time before you master certain techniques and recipes. I am still learning, every day something new." His largely self-taught knowledge he has supplemented with various subject-related courses and master classes at leading institutes at home and abroad, such as in the Czech Republic, Great Britain, Canada and America. As mentioned before, Winkler masters a wide range of old painting techniques. 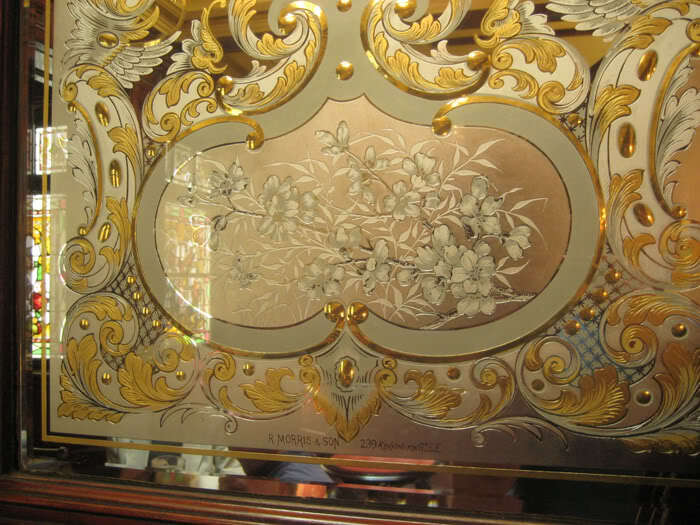 From sand blasting and acid etching in different (color) tones (including Muslin glass) and from (antique) chemically silvering to gold leaf gilding. 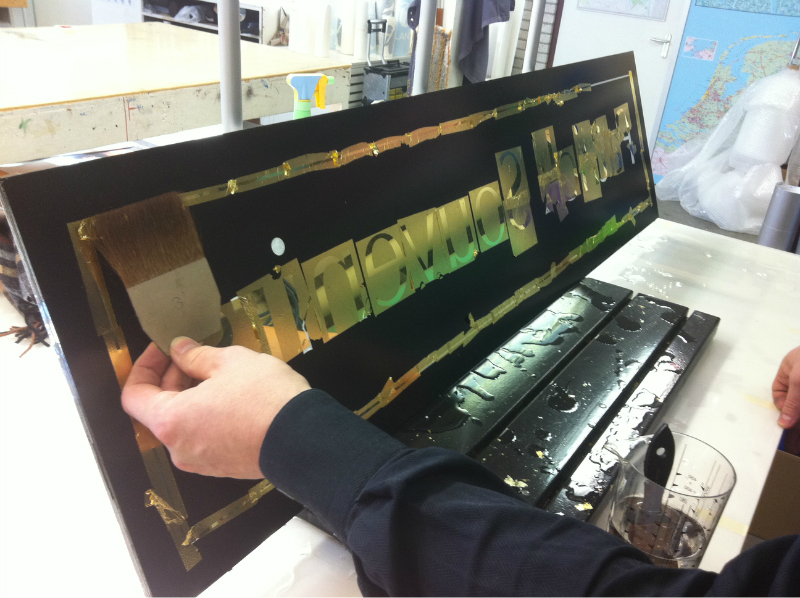 Gilding he does with different methods, such as oil and water gilding, and with different carats of gold leaf or sheet metal. Furthermore Winkler has learned to imitate painting of wood and marble. The mentioned techniques are used separately or in combination, but always with a steady hand, first class resources and the best materials. Winkler always works very precisely and, in some cases, with protective gloves, respirator and other protective clothing, because some techniques can only be performed with very dangerous substances. You can hire Erik as an expert for restoration works, gilding projects, replacing original broken antique mirrors and much more. Need some inspiration? Take a look in the gallery to see his extensive portfolio.